This article was originally published on the Oberlo blog. By combining different optimization techniques, you can double or even triple your sales without new traffic. That calculates to $210K in sales instead of $70K. This article is about sales and how to get more of them – by making people trust you, by removing frictions from your landing page, by engaging with potential customers. This post continues with the Oberlo blog eCommerce blueprint series on ‘How to Succeed in eCommerce’. You don’t buy from someone you don’t trust, right? Most of the visitors will see your website for the first time and will be hesitant to buy from someone they have never heard of. Making people trust your store is a crucial step to getting a customer. CyberSource reports that 85% of UK online shoppers will look for signs to confirm that site they are buying from is secure (CyberSource, 2010). Clearing the air and building a sense of trust is of paramount significance in conversion optimization – and it’s the very first step in making your site sell. Eventually, people buy from you and your brand. Showing yourself or your company behind the store will boost your site’s credibility. Share your story on your About Us page, even if you’re a family-based business or a solo-preneur. People like stories, and honest stories build trust. Prove that you’re a legitimate business by including your physical address and your phone number. Use images of yourself, your team or your office. Or even better, include videos. Tell your visitors why they should buy from you. Never over promote. 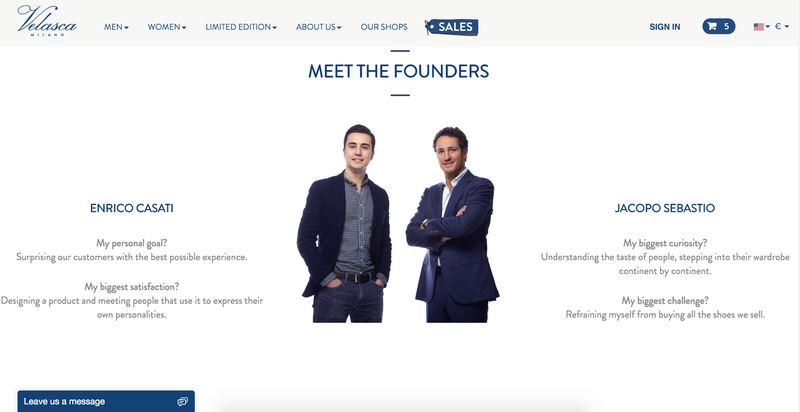 The About Us page is never about selling. At Velasca.com, Italian shoemakers welcome you personally. Among the top factors that enhance customers’ trust is Customer Support and specifically Human Interactions. The best solution for providing customer support is debatable. Forrester research shows that 63% of online consumers were more likely to return to a website that offers live chat. While a best-selling author on Customer Relationships, Steven Van Belleghem, reports that 40% of consumers said they prefer self-service to human contact. It’s best to combine both. The focus here should be on easiness. If you don’t have the resources to provide live chat support, include contact information on your site header and set clear expectations of when you’ll respond. Follow the Zappos example. Instead of hiding their contact information or requiring customers to ask 10 questions before actually submitting their question, they put their phone number on every web page. They not only make it easy to contact them, they encourage customers to contact them. Dune London makes their Live Chat prominent on all pages. 46% of online shoppers said they always check return policies before making a purchase online. Another study shows that over 50% of potential customers leave without paying because they are presented with hidden charges, such as the delivery price. Not showing this information will result in lost sales. 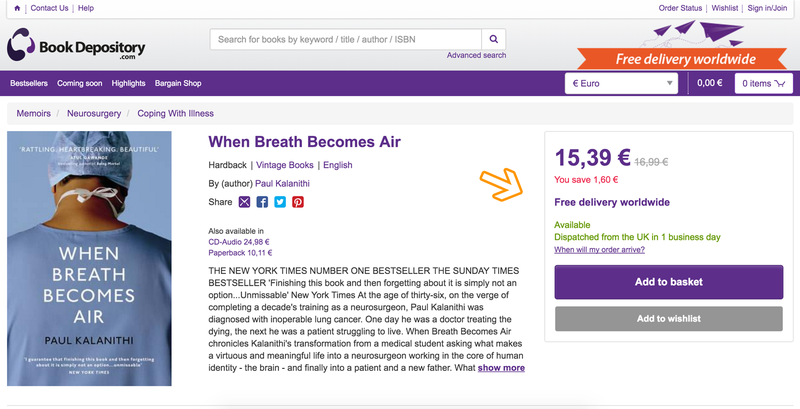 Show this and other relevant information where customers are likely to read it: on a product page, on footer pages, and on every page header. A great way to present all information in one place is the FAQs page. It’s so common that, trust me, almost all your visitors will look for their answers there. Watchshop organizes important information on a product page tabs. Customers reviews are a sensitive topic. More than 2/3 of customers read online reviews before making a purchase, while 7 out of 10 have questioned their trustworthiness. We suggest displaying reviews from a neutral and credible 3rd party. Integrate your site with sites like TrustPilot or SiteJabber. This way you’ll make sure your reviews aren’t censored or fake. 3rd party review sites overview your company in general and provide social proof and feedback on products with customers photos next to it. Apps like SocialPhotos make it easy to display user generated content. Quick tip: As for customer photos, if you don’t have your customer base yet, just showcase the content of users using that product, even though it’s not bought from you. Caption the pictures generically: Great Pics of People Using This Product. Milanoo puts their customers photos next to standard product photos. Accreditations, certifications, better business bureaus, security badges, and trust marks aren’t just fancy elements. These brands carry credibility, and you can use it to your benefit. Privacy and security will always be a top priority for consumers. Trust badges increase some companies conversion rates by 40%. That’s $11,000 in sales instead of $7,300 just because of the trust badge. If you’re using Shopify, the solutions I like are McAfee Secure trustmark and eTrusted. They are super easy to use and definitely worth checking. Choxi includes prominent security badge below their product photos. The Product Page is the place where the actual purchase is initiated. Being the most visited page on your store, it can increase your conversion rates significantly. It should have a very clear focus: to sell, as it’s literally one click away from getting your customers to the checkout. Make sure it keeps that clear focus, is easy to use, and answers all your customers’ questions. A well-built product page will make your customer stay and buy, while on a bad product page, customers will bounce. IRCE 2012 report shows that over 60% of consumers name quality of images and ability to see products from different angles as the most important and critical feature of an eCommerce website. Make sure you have high quality images that can be enlarged. Showcase your products from different angles and always display images of all variations of the product. Include detailed photos. Nobody’s going to buy a yellow t-shirt if they can only see a black one. And the final touch: include photos of people using the product, because people sell. To dropshippers: I know this is a sensitive subject. The majority of suppliers don’t provide good quality images and you usually can’t take photos yourself. You’re dropshipping! Try googling that image and finding the exact same image in high resolution on Google. (This trick usually works for me). 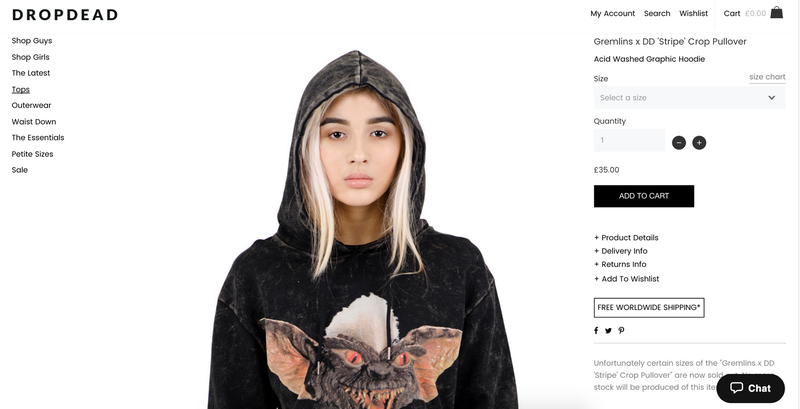 Dropdead engages visitors with multiple big & high quality images. 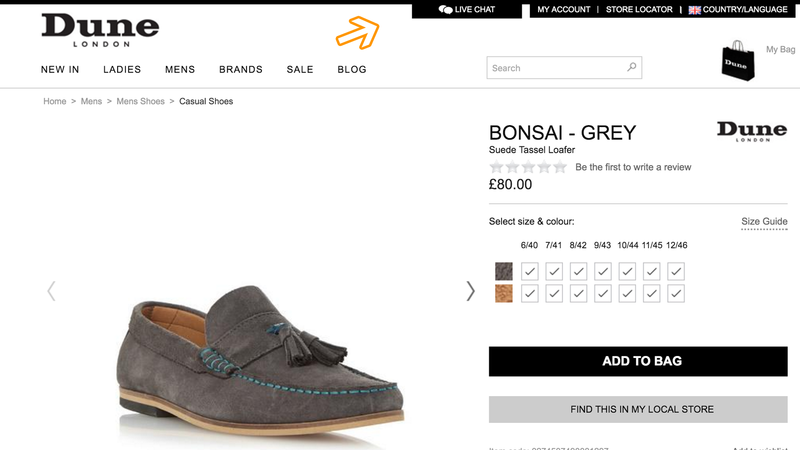 Compelling product descriptions can transform eCommerce conversion rates — it’s common to see increases of 30%-100%. A good product description is emotional, descriptive, talks to the customer, and shows benefits instead of features. Use descriptions to give your customers what they want – confirmation that this is the product they’ve been looking for. This is what makes it unique. Product specifications are equally important, but they serve a different purpose so you should separate them. Besides sales, a more informed customer is less likely to return the purchase. If you are not comfortable with copywriting, look for help from someone else or try apps like Crowd Content. 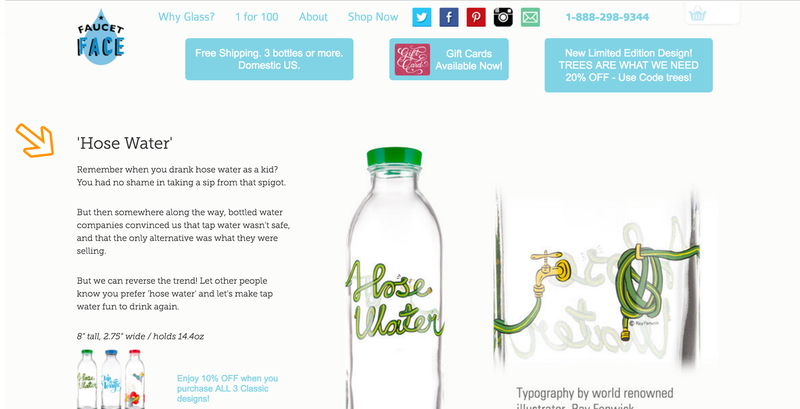 FaucetFace tells a story of what makes their bottles great and why you need one. Everyone expects free shipping. Free shipping is everywhere, and it will dramatically reduce the friction of buying at your store. According to Accent, 88% of consumers would be more likely to shop at a site online if they were promised free shipping. 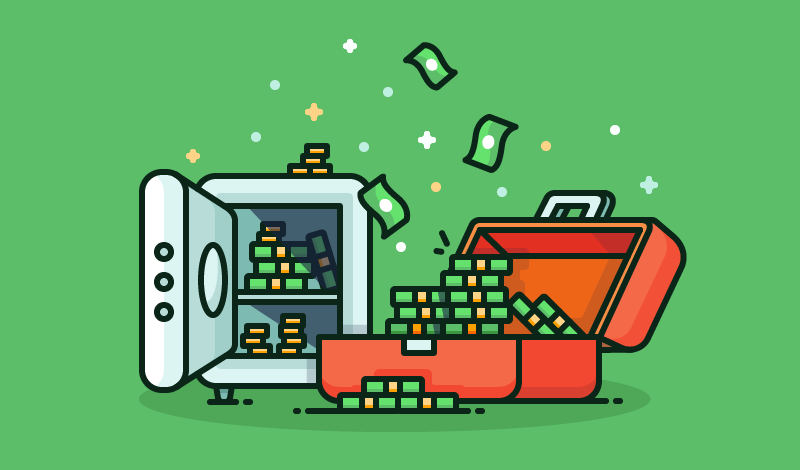 Another study, shows that more than half of your customers will leave your site without paying because they were presented with unexpected costs like delivery charges. Shopify actually names it as one of the top four conversions killers. If you can’t do free shipping on all of your items, try creating other promotions like free shipping on some specific product category or free shipping on orders over a certain amount. Another extremely important thing: show the expected date of delivery, even if it is a long time period. People want to know this and if they don’t, 21% will abandon the sale. Urgency and scarcity tactics are as old as the hills and are widely used by giants like Amazon, Alibaba and Flipkart. They’ve been proven, and they work. We have all seen them: when stores show that only 3 items are left of your favorite product or when a particular product (which wasn’t ever sold at all) is shown as sold out to increase sales of other products. 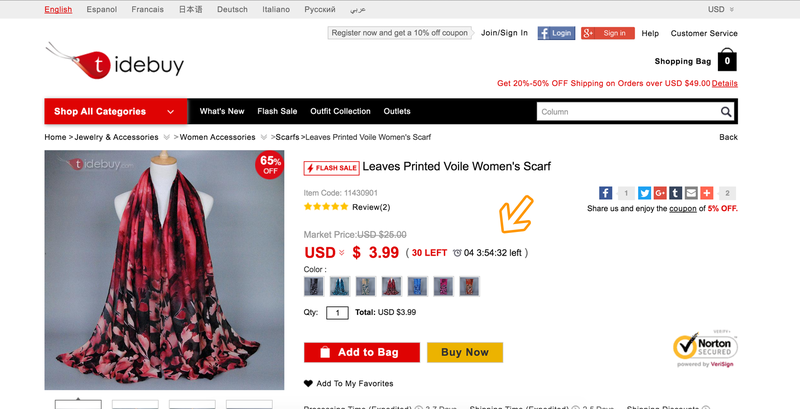 Others offer limited time sales with countdown timers or organize flash sales. There’s really nothing new about this – these tricks are everywhere and it’s up to you how to use them best for your store. Use them and you’ll surely increase your sales; however, don’t overdo it. Too much scarcity makes you look scammy and can work against you. TideBuy.com uses both urgency and scarcity triggers to persuase you into buying. According to Marketing Metrics, the probability of converting an existing customer versus a potential one is up to 15 times higher. Referring to our article headline, repeat customers help you make more sales, with less visitors and overhead costs. Repeat customers are more likely to buy from you, and they are likely to spend more. This is a huge topic, so I will only cover the basic and most prominent strategies. This might not work for you if you’re a smaller seller, but you must adapt them early on to make sure you aren’t throwing away money for customer acquisitions when you already have dozens of customers. On average, only 2% of your visitors will purchase something on their first visit. Retargeting is the method to reach the other 98%. It’s a powerful technique used to show ads to people who visited your site and increase your sales. You can easily set Retargeting campaigns on any advertising platform, such as Facebook, Google, Twitter, or specific apps like Adroll. Retargeting campaigns keep your audience interested by showing your offers to them around the web. It gives you a second chance to land a sale by targeting precisely the people that were interested in you before. 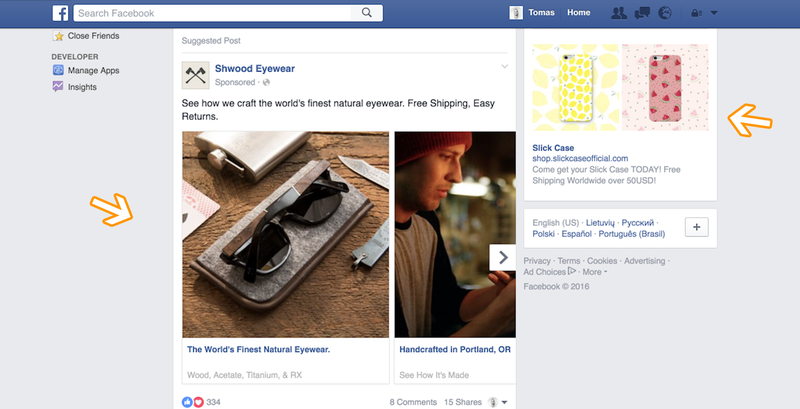 Retarget visitors with discount offers or upsell them with your best selling products, but make your ads are fresh so you don’t annoy them. After browsing hundreds of sites today – my Facebook feed is full of new offers. Almost 70% of your customers will abandon their shopping cart. While visitors are interested in your site, people who abandon their shopping cart are specifically interested in purchasing from you. Send automated email reminders to customers who have abandoned their carts using either built-in Shopify or BigCommerce features. If you do this well, you can recover from 5% to 12% of those lost sales. First, test a friendly reminder that the product is running low and include your store reviews or some other relevant information like a security badge or happy customer photos. Don’t be afraid to test out more aggressive promotions with multiple emails offering limited time coupons. It’s crucial to not let them slip away, so use this last chance wisely. Etsy compliments my taste and invites to complete my purchase. Similar to the retargeting technique, win-back emails allow you to reach out to customers who have created an account on your store or made a purchase in the past. According to V. Kumar, a marketing professor at Georgia State University who studies “win back” strategies, businesses should focus more on lapsed customers because of these three reasons: they have already expressed interest in you; they already know your brand; and with the right tools you can send them better offerings than the first time. CNET reengaged 8.33% of their inactive customers database just by using simple win-back emails with a subject “We miss you – please come back!”. 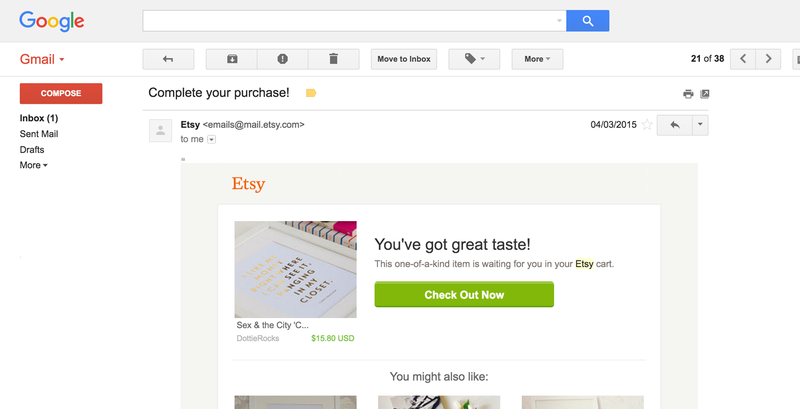 Create these emails with tools like Receiptful or Remarkety. They will guide you through your campaign creation and make it automated. Set it once and it’s running. 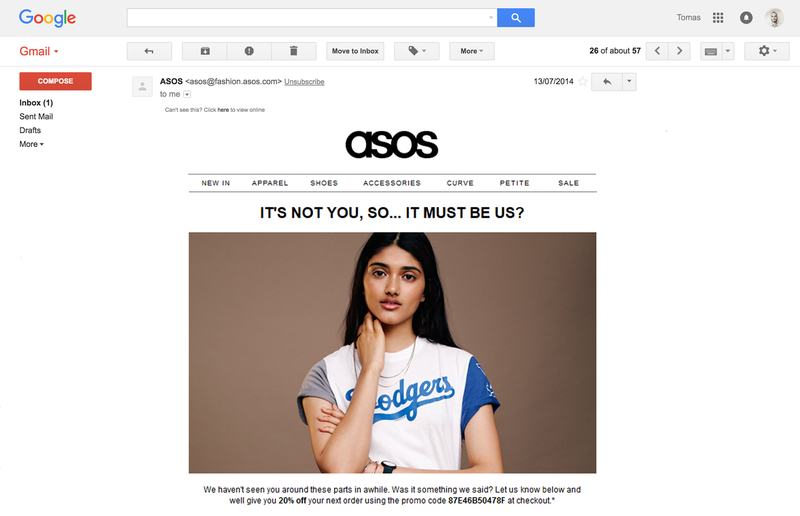 ASOS cares about it’s past customers and offers them a discount. Click Full Screen for the best quality.